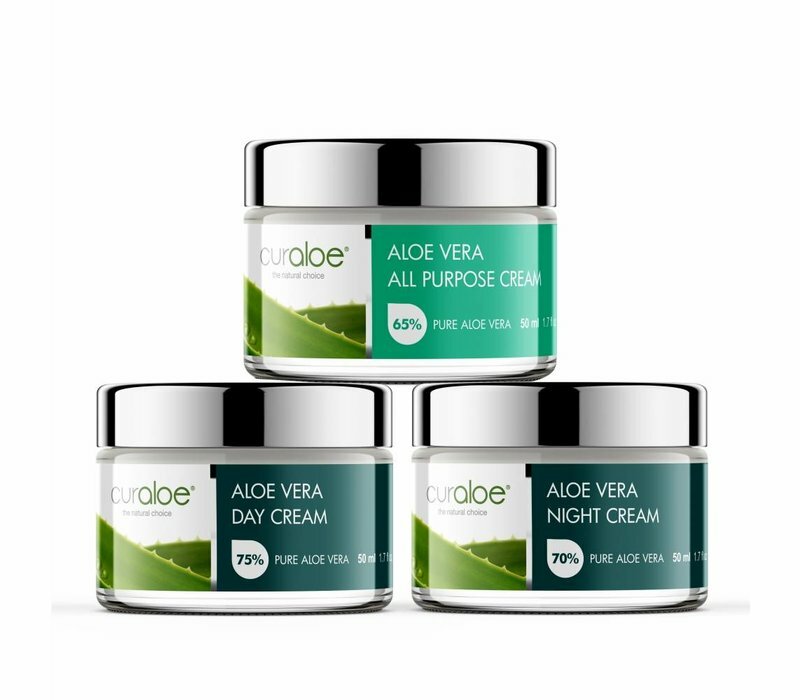 Facial & Body Combo Curaloe® You can find all products to maintain your face for 24 hours a day. You can find all products to maintain your face for 24 hours a day. 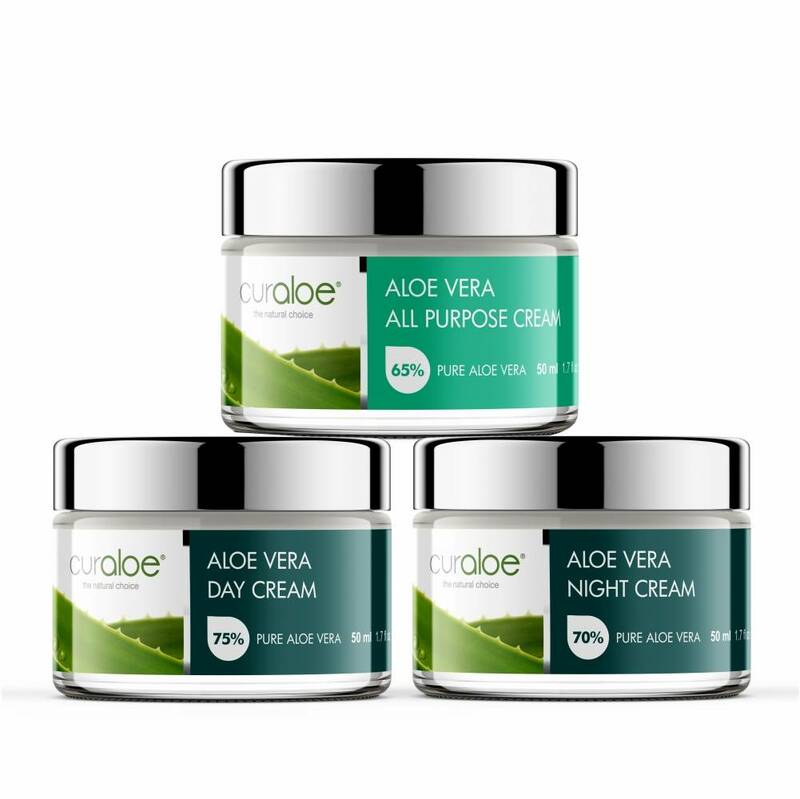 With 70% pure Aloe Vera, African Shea Butter, Lavender Oil and Vitamin E.
Curaloe® Aloe Vera Day Cream is a wonderful combination of Aloe Vera extract, African Shea Butter, Lavender Oil and Vitamin E which will make your skin soft and firm. This cream protects you from the abuse of weather. Application: This product is safe on dry, sensitive skin. Apply on the face. With 55% pure Aloe Vera, African Shea Butter, Grape Seed Oil and Vitamin E.
Curaloe® Aloe Vera Night Cream is a wonderful combination between Aloe Vera extract, African Shea Butter, Grape Seed Oil and Vitamin E which will make your skin soft and firm. Application: This product is safe on dry and sensitive skin. Apply on the face. With 50% pure Aloe Vera, Coconut Oil, Mango Butter, Tea Tree Oil and Vitamin E.
Curaloe® Aloe Vera All Purpose Cream hydrates and softens the skin and promotes skin elasticity. This product has been enriched with Coconut Oil, Mango Butter, Grape Seed Oil, Tea Tree Oil and Vitamin E.
Application: This product is safe on dry, sensitive skin. Apply in ample quantity on the affected skin at least 2 times a day; more often is better. It can be used safely next to medication. The facial creams are incredible. I bought them while cruising in the port of Curacao, and although they were somewhat cheaper there, they are still worth every penny. You wont be disappointed.